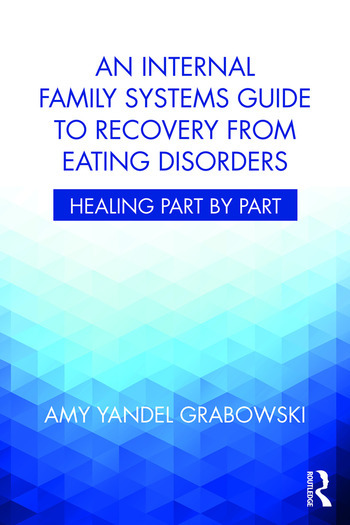 Drawing on the evidence-based Internal Family System (IFS) therapy model, An Internal Family Systems Guide to Recovery from Eating Disorders: Healing Part by Part addresses the necessity of healing the eating disorder sufferer’s three groups of inner "Parts": the Mentors, the Advocates, and the Kids. In order to reconnect to their sense of Self and to achieve an inner balance necessary for recovery, the reader learns to address the unique needs of each of their "Parts." Written in an accessible style, this book combines compassionate examples from the author’s client cases and her own recovery with a step-by-step framework for identifying and healing the readers’ Parts using the IFS model. Each chapter ends with questions for the reader to answer to further enhance their personal recovery. An Internal Family Systems Guide to Recovery from Eating Disorders:Healing Part by Part will be essential to mental health professionals treating clients with eating disorders and to the clients themselves. Amy Yandel Grabowski, MA, LCPC, ATR, is the founder and director of The Awakening Center, one of the first outpatient eating disorder treatment programs in Chicago, Illinois. She has provided individual psychotherapy and group therapy to women and men with eating disorders for over 30 years and also has led eating disorder support groups for over 20 years. She was trained in the Internal Family Systems therapy model by founder Dr. Richard C. Schwartz and has been a visiting lecturer on eating disorders at Northwestern University, Illinois School of Professional Psychology, National Louis University, and DePaul University. Amy is also a professional member of the National Eating Disorders Association and the International Association of Eating Disorder Professionals and a past member of the Academy of Eating Disorders.